Durham and taxes: Where's the beef? But I was intrigued to see the Lockies' report on local governmental tax burdens, since Durham always gets the tag of being the high-cost town in the Triangle when it comes to the cost of public services. Far from being surprising, the report details exactly what one would rationally expect to be the case. First off, there's not a heck of a lot of difference between larger cities in the Triangle when it comes to tax burden. Durham's at $1,991/year, followed closely by Cary at $1,976, with Raleigh weighing in at $1,816. $185 difference per year between Durham and Raleigh is pretty understandable in light of the far different "base" size of the two counties; Wake has three times the population, but both counties have fixed overhead costs for governmental staff, sheriff and police, fire protection, water delivery and treatment, etc. Only seems natural, after all, to have a higher per-capita cost in the smaller communities. Rumor: Verizon FiOS tv/phone/Internet coming to Durham? OK, this may not be all that exciting for those folks who don't know their DSL from their DOCSIS from their 1080i. But if you're an A/V geek or techie -- or if you're just sick of your current cable TV or telephone service -- a rumor circulating on the Internet (where else?) may make you stand up and take notice. The good folks over at BroadbandReports.com are a-twitter with a rumor that Verizon is on the verge of announcing its FiOS service for the Bull City in the next few weeks. RTP and South Durham are reported to be the first areas served, an unsurprising development given the possibility of selling business-class services into Research Triangle Park businesses. Downtown and north Durham along the Duke Street corridor -- given the proximity to Verizon's central offices up there -- are reported to follow closely thereafter, according to the BroadbandReports.com message board. FiOS is Verizon's fiber optic-based phone, television and Internet service. A fiber optic cable is run to your house, allowing Internet access that's several times faster than what Time Warner and other cable providers can provide. In many communities, FiOS TV offers a package of 200 channels in all-digital quality for $42.99 a month, too. Find out more at Verizon's web site. The folks proposing the 240-unit Fairfield at Hillandale apartment complex proposed for a tract of land just north of I-85 between Hillandale and Guess are sponsoring a neighborhood meeting tomorrow night to discuss the project. The meeting is scheduled for 7pm Thursday night at the DPS Staff Development Center at the corner of Carver and Hillandale. As Jim Wise noted in his very good The Durham News article earlier this month, the project team is requesting a rezoning to change a suburban multifamily zoning to a denser "urban multifamily" land use. We'll have more on the project and the neighborhood meeting in Friday's BCR. MiLB museum: Just who's footing the bill? Both the N&O and Herald-Sun have good coverage today of Marc Basnight's visit to City Hall for the "town hall" meeting with the state Senate leader. Reading their comprehensive coverage, my eyebrows went up a bit at the mention of looking for state subsidies for the proposed Minor League Baseball museum and "fan experience" center. Perhaps I hadn't been paying proper attention during earlier discussions of the project, but it was somehow my impression that MiLB was performing a feasibility and fund-raising study to determine their ability to pay for a museum. Apparently, the plan is actually for MiLB to pay the "operating costs" of the facility, with the government picking up the tab for the land and construction costs. But I'm still left scratching my head over how it's a Durham (or a North Carolina) responsibility to fund a museum for a sporting league. Photo trivia time: Can you place this photo? Driving around North Cackalacky this weekend, I spied the following old advertisement sitting out on the side of a quaint old building. A reminder that N.C. state Senate leader Marc Basnight will be in town today for a town-hall meeting starting at 4 p.m. on the second floor committee room of City Hall downtown. He'll be joined by Durham state Sen. Floyd McKissick, Jr., and will have a chance to hear Durham's legislative priorities and concerns for the upcoming legislative year. The meeting is open to the public, and should be a good opportunity to hear the City Council's thoughts and ideas for Basnight, one of the most powerful pols in the state government. Ray Gronberg's got a very good run-down of the topics you can expect to hear raised at tonight's meeting in his H-S article today. According to Gronberg's reporting, the City Council's priorities will likely include increased funding for local courts, support for ongoing water cooperation with the state, tougher penalties for gang activity, and state funds to support Minor League Baseball's plans for the old Durham Athletic Park. Kudos to Aidil Collins and all the folks in Uplift East Durham and Preservation Durham for this weekend's very successful "Old East Durham" home tour. By my best guess, upward of one hundred Durhamites -- including both home-buyers/Realtors and the occasional lookie-loo like myself -- stopped into the neighborhood to see a mix of renovated, occupied homes and houses available for sale and renovation through Preservation Durham's "Endangered Properties" program. Walking down Vale St. -- one block south of Angier, and one of the early hot-spots for revitalization in East Durham -- one is impressed by how quiet and peaceful the street is, the hum of the Durham Freeway (and a quick commute to Duke, downtown and RTP) barely audible over the trees. The street consists largely of houses from the early twentieth century, and while some appeared to remain rental properties, three neighbors opened their doors to show the work they'd done inside their homes. Seeing the terrific renovation and decorating that had taken place inside these beautifully detailed old Victorians was inspiring. One house still under rehabilitation on Vale had features and touches like wainscoting, a nicely upgraded kitchen, and a huge first-floor bathroom -- honestly, if you had been transported into the house from space, you'd think you were in Watts-Hillandale. Pretty precious Porsches in the parched Piedmont? Update: ABC 11 (WTVD) picked up this story for their Tuesday Jan. 29 newscast. See their web site for streaming video and a transcript. "There's a facility at 111 N Duke St... that was taking advantage of Wednesday's warmer water to wash at least three Porsches. No water recycling to speak of--one of the photos attached shows the extreme amount of runoff. I don't like being a nag, but it seems that given the current climate, washing your cars in a totally wasteful manner is just ridiculous." And just what are a bunch of Porsches doing getting washed in Brightleaf Square? We're not 100% sure, but the most likely explanation seems to be that they live there. The dear, departed Blazer Manpurse noted at Bullsh@t last year that 111 N. Duke is the home of the Ingram Collection, a private auto collection belonging to one Bob Ingram, vice chairman for pharmaceuticals with GlaxoSmithKline, which of course has a large RTP-area presence. "Bob has understandably let us know that no pictures are to be taken while visiting the collection. It is also very important, because the cars in the Ingram Collection are not roped off, that people do not touch or open any of the cars. Additionally, the Collection management asks that people be cognizant of buttons, belt buckles and purses around the cars. The Collection is located behind Fish Mongers and Toreros on Main St in down town Durham. The building is coffee colored and has a black awning with 111 N. Duke St on it that faces Gregson Street." School reassignment is a subject you don't hear much about in Durham; it typically disrupts our neighbor to the southeast instead, where lawsuits and (this year) protest marches aren't uncommon in discussions about the Wake County schools. In Durham, on the other hand, the district you're in has usually been the district in which you stay. This year, however, DPS has given a heads-up that the very popular Creekside Elementary in South Durham may have its assignment zone parceled out differently come the new year. As the N&O's coverage pointed out, don't expect parents to go quietly on this one. A public hearing is scheduled for Feb. 7 at 6:30 pm at Creekside to discuss the school system's recommendation, which itself is on the agenda for the Jan. 31 meeting. All of which, of course, leads to an important question: just what makes this issue so important to Creekside parents? Before I hazard my guess, I'd like to encourage Creekside parents (and folks in the Creekside zone) to share their thoughts and concerns over redistricting on the comments here. As a married man without kids, my perspective on schools is very different in all likelihood from those with a direct stake in the game. Still, even though I don't have a parent's perspective on the issue, and though I know enough to not trust fully the data that comes out of the flawed end-of-grade testing programs, there's no doubt that those numbers tell part of the story about what's working and what's not at local schools. The fact that an uptick in violent crime this month has had understandable reverberations in and among the Duke community -- not surprising, since robberies, assaults and shootings are typically concentrated in several segments of the community that don't directly border the Gothic wonderland. Unfortunately, the response of some student commentators have been perfectly predictable. One Chronicle columnist has made it a regular sport to bash the Bull City this past year, providing such joyful nuggets about Durham life as "the bar scene is pretty weak," "if you think Durham is already great--well, then you should probably be drug tested," and "I am beginning to wonder whether the Duke-in-Durham experience has really been worth the risk." On the flip side, some Duke students have written into the Chronicle to express the need for Dukies to continue to engage with the Bull City community -- as seniors Ellen Bolen and Cy Stober did on Friday. Students made broad generalizations about Durham being unsafe and one student suggested to "just build giant fences around the school." Statements such as these perpetuate the "us vs. them" mentality. These crimes were not just committed against Duke students, but against the Durham community as a whole.... A Duke student has the right to feel safe, but so does every citizen in Durham. Durham is a great community and it has a lot to offer to those who are willing to commit to it. Not surprisingly, the reaction in the comments section was hostile... much of it, in all likelihood, coming from folks not even associated with the university. 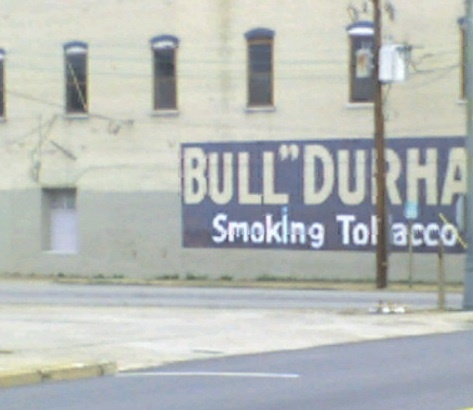 Much of it was the often-seen, borderline racist linkage between issues of safety and Durham's diversity, with one commentor noting that Durham "is just a scaled down version of New Orleans," where poor African-Americans suffered from "corruption of the human soul caused by the 'entitlements' of the Welfare Society." Others tried to dance around the issue more elegantly, but often came back to slightly more eloquent versions of this pithy comment: "I'm tired of BS -- of having to appease the locals of this sh!thole." Why bring this up now? Because these comments were on my mind as my weekend began after work on Friday, and I found myself ruminating over the negativity that hangs over the Bull City in so many people's minds. And that's never a good feeling; it only tends to fill one's mind with one's own sourness. Stewing in my thoughts, I decided to head out to see a movie that night (the Blade Runner re-edit that's made its way to the Carolina Theatre.) It turned out to be the best decision I made all week.